Saarland issued the commemorative charity stamp, shown at the top of the image above (Mi. #289, Sc. #B74), on April 3, 1950. The stamp features a portrait of Blessed Father Adolph Kolping and commemorates the 100th Anniversary of his founding of the "Federation of Journeymen of the Rhine Region" in 1850. Father Kolping (1813-1865), the son of a shepherd, was born in Kerpen and was ordained in 1845. He spent his life mentoring young journeymen in the Rhine Region, when he was the vicar of the Cologne Cathedral. He was beatified by Pope John Paul II on October 27, 1991. The postage stamp, shown at the bottom left of the image above (Mi. #290, Sc. #221), was issued on April 3 to commemorate the 10th Anniversary of the Death of Peter Wust (1884-1940). Peter Wust was a renowned existentialist philosopher from Rissenthal. The magnificent looking charity stamp, shown at the bottom right of the image above (Mi. #291, Sc. #B76), is the first in an annual series of large format philatelic-subject stamp issues for "Stamp Day". These stamps were issued to publicize stamp collecting, and they usually coincided with major philatelic events. 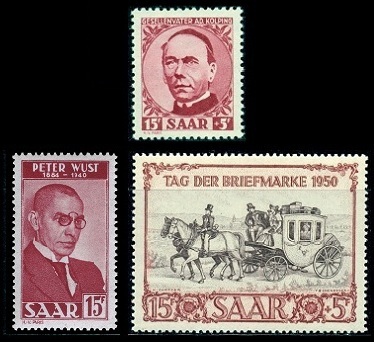 The 1950 Stamp Day commemorative was issued on April 23, during the International Philatelic Exhibition (IBASA) in Saarbrücken. The design features a classic postal coach. Being that only 124,000 of these stamps were printed, they are rather scarce today. The stamps also exist in miniature panes of 10 which are rare. The charity stamp shown above at the top left (Mi. #292, Sc. #B75) was issued on April 28 to raise money for the Red Cross. The design reflects the theme of "Feeding the Hungry" and shows an elderly man with a soup spoon. The commemorative postage stamp shown above at the top right (Mi. #296, Sc. #225) was issued on July 8 to commemorate the 400th Anniversary of the Town of Ottweiler. The stamp shows the City Hall Plaza with the City Hall and church in the distance. Ottweiler is situated on the Blies River north of Saarbrücken. It was the former seat of the District of Neunkirchen in Saarland. The town is famous for the fine porcelain that is produced there. The three commemorative postage stamps shown at the bottom of the image above (Mi. #293-95, Sc. #222-24) were issued on June 29 to celebrate Holy Year 1950. The designs depict a bronze statue of St. Peter, located in St. Peters Basilica in Rome. The two postage stamps shown above (Mi. #297-98, Sc. #226, #C12) were issued on August 8 to celebrate the admission of Saarland to the Council of Europe, the precursor to the European Union. In order to give Saar wider international recognition, the French government sponsored their admission to the Council of Europe in an August 1949 proposal. The Federal Republic of Germany and the Republic of Austria were also approved for admission in 1950. The stamp designs feature an open book, a World globe, and a banner, emblematic of the Council of Europe. Only 160,000 of the 200 Fr. airmail stamp were printed, making it a very scarce stamp today. 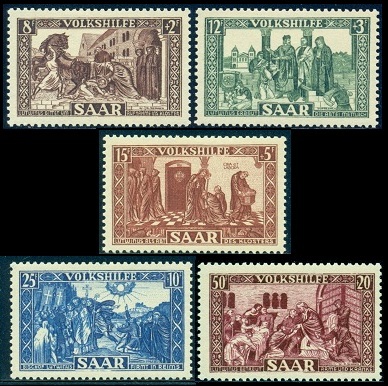 The annual Volkshilfe charity stamp set shown above (Mi. #299-303, Sc. #B77-81) was issued on November 10. The stamps feature scenes from the Legend of St. Lutwinus. St. Lutwinus (660-722) was a Count, the son of a noble family, and the Archbishop of Trier. He was buried in Mettlach, where the abbey he founded is located. 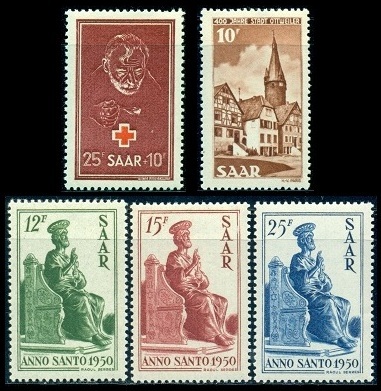 The designs of these stamps are based on mosaics by Alfred Gottwald (1893-1971), and they are as follows: Lutwinus seeking admission to the abbey, Lutwinus building Mettlach Abbey, Lutwinus as an Abbot, Bishop Lutwinus at Reims, and Lutwinus giving aid to the poor and sick.